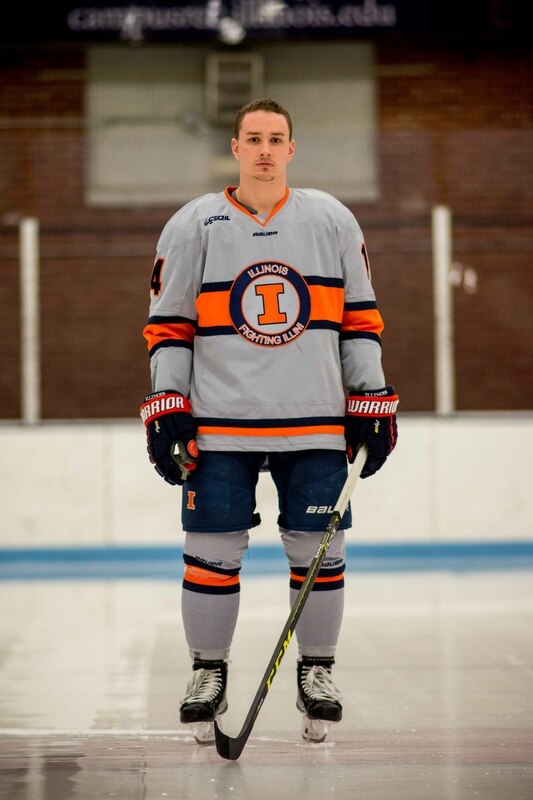 Illinois hockey forward Chris Lozinak looks to his grandfather for support. 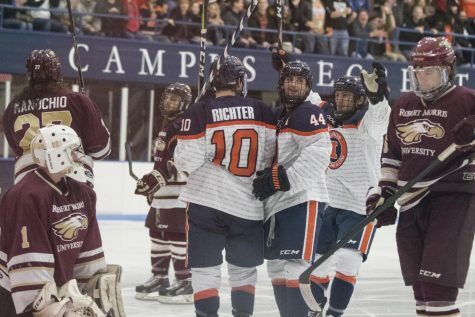 The distance from Rochester, New York, to the University of Illinois Ice Arena is about 700 miles. Mike Kehoe would make that drive in a heartbeat. 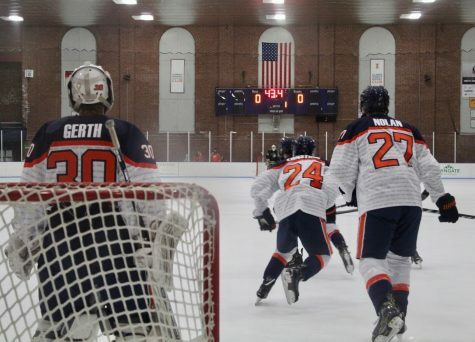 “The guy will drive 10-plus hours in one day just to watch me play a hockey game,” Illinois forward and Kehoe’s grandson, Chris Lozinak, said. While Lozinak is not a senior — he’s a junior graduating this May — he celebrated Senior Weekend and his final career home games last weekend with five of his teammates. His parents stood on the ice with him while head coach Nick Fabbrini officiated a pregame ceremony. Kehoe, who lives in Rochester, was planning to drive to Champaign on Friday to catch his grandson’s final college home games. Instead, an emergency family obligation cancelled his plans, and he settled on listening to the online radio broadcast. Lozinak responded by jumping on the broadcast to give a pregame shoutout to Kehoe before Friday’s game. “Hi, Grandpa!” Lozinak said on the airwaves. That was not the only way Lozinak paid tribute to his grandpa during Illinois’ victory over its in-state conference rival, Robert Morris. Lozinak turned up the ice midway through the first period on a broken play. 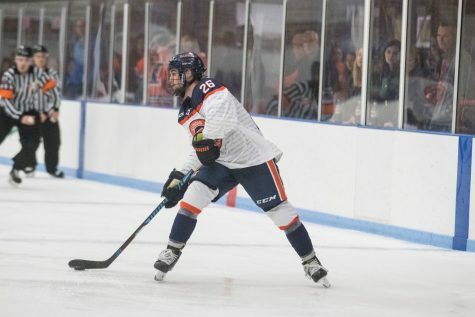 Forward David Kellner screened the Eagles’ defenders at the center of the ice, creating a wide-open net and an easy goal for the 23-year-old Lozinak, the first goal of the game for Illinois. Fabbrini said the third-line forward opening the scoring on this night proved the depth Lozinak provides the Illini. 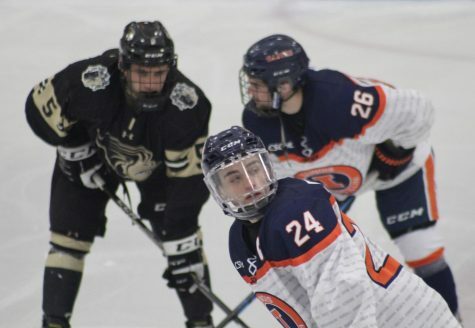 Kehoe has been to several of Lozinak’s 100 career college games over the past three years. He drove to Chicago earlier this year when Illinois played a series against Lewis University, and the last time he was in Champaign was two years ago. He even drove from his home to Athens, Ohio, to see the Saturday night game between Illinois and Ohio last November, only to drive home that same night — more than 14 hours of driving in one day. “He loves to drive everywhere he goes,” Lozinak said. The junior said nobody in his life has been more influential or supportive in regards to his hockey career. 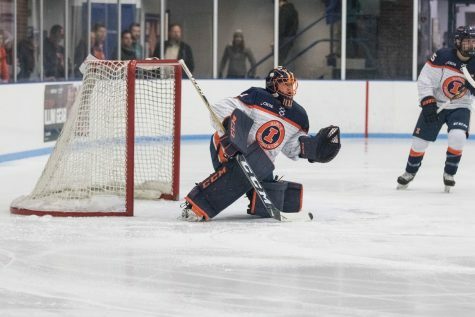 Lozinak started playing roller hockey as a kindergartener in Texas and transitioned to ice hockey when he moved to New York. 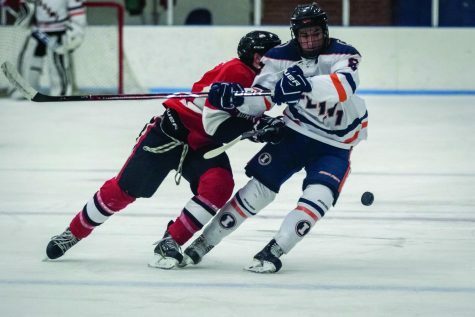 Lozinak spent three years on the juniors hockey circuit before enrolling at the University. He played for the Portland (Maine) Jr. Pirates for 26 games to begin the 2013-14 season, tallying six goals and 15 points. He moved onto the South Shore (Massachusetts) Kings for 10 games, but he eventually asked for and was granted a release. Lozinak drove from Boston to Rochester on his way to Sault Ste. Marie, Michigan — a small town situated on the northeastern end of Michigan’s Upper Peninsula. He was going to Michigan to try out for another junior team. Having to drive more than 10 hours through Canada in a snowstorm, Kehoe offered to come with for the ride. After the stint in Sault Ste. Marie, Lozinak came to the University. 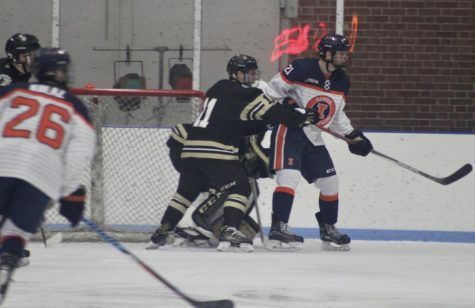 He scored 12 goals and totaled 35 points over his first two seasons at Illinois. The junior has six goals and 10 points this season. 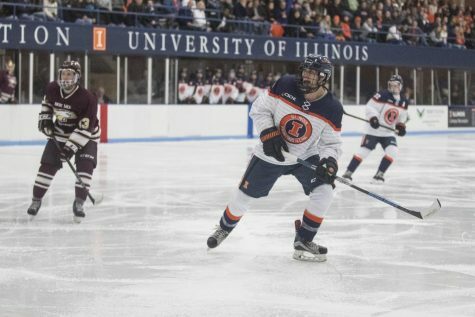 As Illinois gears up for its conference tournament, the American Collegiate Hockey Association playoffs and the end of Lozinak’s career, Chris knows he has one fan a 10-hour drive away.